Welcome to another moment of I couldn’t get it right if I tried. In Fairfield, Conn. Police say they had ample warning of a bank robbery because the two suspects called the bank ahead of time and told an employee to get a bag of money ready. I suppose they wanted them to shove it out through the drive-up window too. Police arrested 27-year-old Albert Bailey and an unidentified 16-year-old boy on robbery and threatening charges Tuesday afternoon at a People’s United Bank branch in Fairfield. I’m just imagining how this conversation must have gone: “Hello, May I help you?” “Yes, we’ll be by in just a few minutes and my partner and I are going to pob your bank. Could you be so kind as to have the money ready when we arrive.” “Why sir that won’t be a problem at all. We’re looking forward to doing business with you.” Sgt. James Perez says the two Bridgeport residents showed up about 10 minutes after making the call and were met by police in the parking lot. There’s nothing like crooks phoning in their own tip. Perez told the Connecticut Post the suspects were “not too bright.” Well, it goes to show you that making reservations is good for some things, bank robbery, not so good. Lesson learned? You need to actually have an IQ to be a thief. Give Me All of Your Money and Don’t tell My Mom. In this little story more ineptitude abounds. A teen robber asked a clerk not to “tell my mom” what he’d done before fleeing from the scene of his attempted hold-up in a Salt Lake City store. I have to admit, after that, the first thing I would do is call his mom. If he’s more afraid of her than the cops. that’s saying something about mom. Police said the teenager went into a convenience store early last Saturday morning and approached the counter with numerous items. So far so good. As the clerk put his supposed purchases through the till, the would-be thief tried to sneak behind him and hold a knife to his neck. A knife? If you’re going to enter a life of crime, you need real weapons. But the quick-thinking clerk spun around with his hands up and hit the teenager in the face, knocking him to the floor. I’m betting this kid was a computer geek that ran out of munchies playing World of Warcraft and thought the magic knife he got from the Dwarven master would hold its own in the real world. Wrong. Just before he took off, the teen asked his victim not to call the police and added: “Don’t tell my mom.” That really worked. Now its all over the internet and everyone knows. I hope your mom takes your WOW account away from you. We’re just full of them today. A “mystic” has been jailed for eight months after claiming he could cure a blind man by feeding him gherkins laced with LSD. How do you convince someone of that? “Eat this pickle man, it’s magic. It’ll cure what ails you.” Jobless hairdresser Patrick Baecker, 35, posed as a mystic healer and told Axel Pfeffer he would make him see for £20,000. (approx 40,000 USD) Apparently it didn’t work. Imagine that. The court in Fehmarn, Germany, heard how the former motorcyclist had tried everything to restore his sight after losing it in a crash. Yes lawyers are good at putting that poor poor pitiful me spin on things. Quick reality check, dude you paid a lot of money to a hairdresser who told you he’d cure you with a pickle. I bet they weren’t even brand name pickles. Baecker fed him pickles laced with powerful mind-bending hallucinogenic drugs to induce visions. You’ll see alright, but we didn’t guarantee what. “You are a hairdresser, not a shaman,” Judge Markus Faerber told Baecker in court. He’s also not a very good con man. Jail time for you. We now round out our collection of screw-ups and yo-yos with this tasty tidbit. Police say they charged a Pennsylvania man with public drunkenness after he was seen trying to resuscitate a dead opossum along a highway. 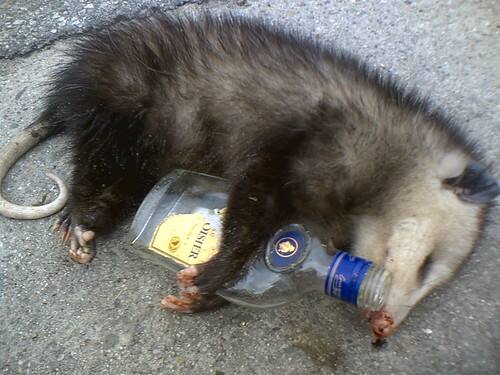 I wonder if the opossum is playing ‘possum? Now the other question… CPR or Mouth to Mouth? State police in Punxsutawney say several witnesses saw 55-year-old Donald Wolfe, of Brookville, near the animal Thursday afternoon. Hey, isn’t that the place where they have the official groundhog for Groundhog’s Day? Isn’t his name Phil? Maybe the guy thought he was saving Phil’s life, a hero of the community and all that. No, I’m not buying it either. Police arrested him along the highway, Route 36, in Oliver Township, about 65 miles northeast of Pittsburgh. A state police news release did not specify how Wolfe was allegedly trying to revive the roadkill. And we thank them for that. That may have just been too much information.